Andrew Waite is an accordion player and composer from the Scottish Borders. He plays in bands such as TYDE, DALLAHAN, FOURTH MOON and ELIZA CARTHY WAYWARD BAND. His music is rooted in Scottish, Irish and English Trad music but he takes influences from many genres such as Jazz, Gypsy Jazz, Bluegrass, Funk and Classical music. Andew cofounded the band Tyde in 2008 and got to the finals of the BBC2 Young Folk Awards. He also secured a record deal when he was 15 years old and recorded two studio albums. 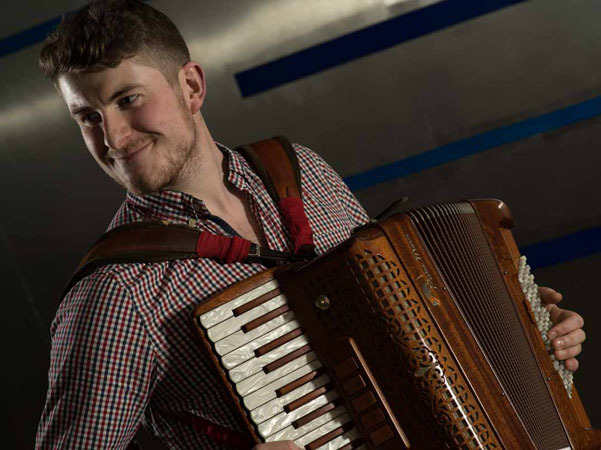 In 2011 Andrew was a finalist in the ‘BBC Young Traditional Musician of the Year’ and was an ‘Up and Coming Act of the Year’ Nominee at Na Trads 2015. In 2015 he joined the band Dallahan who were a ‘Folk Band of the Year’ nominee at Na Trads 2016 and released the album ‘Matter of Time’ which was also nominated for Album of the Year at Na Trads 2016. Andrew Joined Eliza Carthy and the Wayward band in 2013 and has been regularly touring with them since then. In February 2017 they released their debut album ‘BIG MACHINE’ and it reached number 25 in the UK Album Charts. As well as playing with different bands Andrew has also appeared on stage with Sting, The Unusual Suspects, the RSNO and performed as a guest on over 15 albums. When he was 13 years old he performed at the Royal Albert Hall at the first ever BBC Folk Proms.